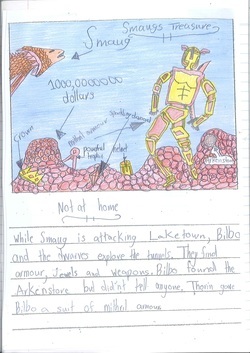 While Smaug is attacking Laketown, Bilbo and the dwarves explore the tunnels. They find armour, jewels and weapons. Bilbo found the Arkenstone but didn't tell anyone. Thorin gave Bilbo a suit of Mithril armour. 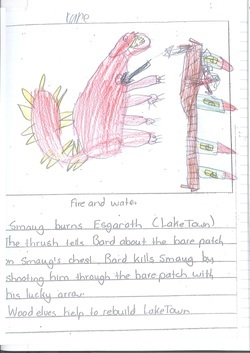 Smaug burns Esgaroth (Laketown). The Thrush tells Bard about the bare patch on smaug's chest. Bard kills Smaug by shooting him through the bare patch with his lucky arrow. Wood elves help to rebuild Laketown.